Sharply escalating its military campaign, Israel dropped a quarter-ton bomb on a Gaza home Wednesday to assassinate top Hamas fugitives, killing nine civilians as Islamic militant leaders got away. The nine dead were all members of the same family, including the parents and seven of their children, Palestinian officials said. The body of a 4-year-old boy, torn in half, was among those pulled out of the rubble. Israel says it launched the airstrike in the Sheik Radwan neighborhood, a Hamas stronghold, because Hamas commanders there were planning more attacks on Israel. Israel also says the home it attacked was a "meeting place for terrorists." After the Israeli attack, hundreds of Palestinians gathered at the flattened house in Gaza, vowing revenge and calling the Israelis terrorists. "As bodies were pulled from the rubble here, you could feel the crowd, the anger of the crowd," reports CBS News chief foreign correspondent Lara Logan. "As people surged forward, it almost seemed to go out of control and then, in one dramatic moment, a man in the crowd began a chant, a traditional Palestinian chant of resistance, also vowing revenge." "Hundreds of people," Logan continues, "who in one moment, were surging forward in anger, almost out of control, suddenly stood rooted to the spot and repeated this chant, which has been a chant of resistance against the Israelis for the past few years." Further heightening tensions, the Lebanese guerrilla group Hezbollah fired rockets at northern Israel, and later announced it had captured two Israeli soldiers during the cross-border fighting. The Israeli Defense Ministry confirmed soldiers had been captured, and said it held Lebanon responsible for their safety. Israeli aircraft struck roads, bridges and Hezbollah guerrilla positions in southern Lebanon. Heavy exchanges of fire along the border were reported. The Israeli army said there were "casualties" but declined to confirm Arab television reports that three soldiers were dead. Israeli ground troops entered southern Lebanon on Wednesday to search for the two newly captured soldiers. That's according to Israeli government officials, who say the soldiers are trying to keep the soldiers' captors from moving them deeper into Lebanon. They say Israeli troops went into a southwestern sector of Lebanon just over the border from where the soldiers were captured. Prime Minister Ehud Olmert said Hezbollah will pay a "heavy price" for its actions. Israel's military, meanwhile, ordered residents of Israeli towns along the northern border to seek cover in underground bomb shelters. Hezbollah's capture of Israeli soldiers opened a new front in Israel's battle against Islamic militants, and threatened to complicate its efforts to win the release of an Israeli soldier captured two weeks ago by Hamas-allied militants in Gaza. Hezbollah said it had captured the soldiers to help win the release of prisoners held in Israel. Hamas had made identical demands in seizing the Israeli soldier. Israel has been conducting a large-scale military offensive in Gaza, which borders southern Israel, since Hamas militants captured the soldier. The campaign's declared aim is to force Hamas militants to turn over the captured Israeli soldier and to halt ongoing rocket fire on southern Israel. Wednesday's aerial attack in Gaza City is bound to intensify international criticism of Israel. The United Nations has already complained about what it said was disproportionate use of Israeli force in the Gaza operation. The Israeli military said Mohammed Deif, the leader of the Hamas military wing and No. 1 on Israel's wanted list for more than a decade, was wounded in the 2:30 a.m. airstrike, but it didn't know how badly. Israel blames Deif, a master bombmaker, for many suicide attacks against Israeli targets. The bombing raid on Wednesday was the army's fourth attempt to kill him; in a 2002 missile strike, he lost an eye. Palestinian security officials said Deif was lightly wounded, despite Hamas claims he had escaped harm. 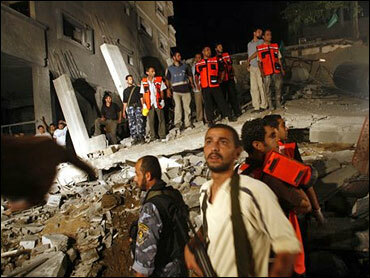 The strike destroyed a two-story house in the Sheik Radwan neighborhood, a Hamas stronghold in Gaza City. Rescue workers pulled from the rubble the mangled body of a child, clad in a red-T shirt, whose head was blown open by the blast and whose lower body was torn off. Rami Samour, 25, who lived nearby, said the blast was so powerful that it blew the mutilated body of a woman into a neighboring house. Rescue workers placed body parts into bags, as other people sat on the ground, apparently in shock. The house belonged to Hamas activist Dr. Nabil Abu Salmiyeh, a lecturer at Gaza City's Islamic University. Palestinian hospital officials said Abu Salmiyeh, his wife and seven of their nine children were killed, and rescue workers said four people were still missing. The dead children ranged in age from 4 to 18, with the oldest suffering from a physical handicap, medical officials said. Hospital officials said 37 people were wounded, three of them seriously. Israel said leaders of the Hamas military wing, including Deif, were meeting in Abu Samiyeh's home, and accused the militants of using civilians as a shield. "Israel is compelled to take action against those planning to unleash lethal terror attacks against Israeli citizens," said David Baker, an official in the office of Israeli Prime Minister Ehud Olmert. "Palestinian terrorist leaders continue to take refuge amongst and hide behind their own civilians." Jittery Hamas activists carefully inspected the bodies being brought into the hospital. At daybreak they disclosed that Raad Saed, a senior Gaza commander, was wounded and is being treated at a secret location. Israel Army Radio said Ahmed Ghandour, a Gaza commander involved in the June 25 Palestinian militant raid in which an Israeli soldier was captured, also was inside the house and seriously wounded. More than 60 Palestinians have been killed in the offensive, most of them gunmen, but about a dozen have been civilians. One Israeli soldier also has died, shot by fellow troops. Abu Obeideh, spokesman for Hamas' military wing, issued an unusually strong condemnation, using language employed only when Israel has assassinated top Hamas leaders. "We will make the leaders of the Zionist regime regret this Nazi crime," he said. He later told The Associated Press that the attack would "change all standards, opening new options that never have been used." Security officials said Israel dropped a 550 pound bomb on the building, which collapsed from the force of the blast, burying people under the rubble. Palestinian rescue teams dodged broken water pipes and electricity wires searching the rubble with bulldozers, shovels and their hands and to get to injured people screaming for help. The house next door, set on stilts, leaned precariously. All the windows in the surrounding houses were blown out, and some walls were pocked with small shrapnel holes. Earlier in the day, Israel sent tanks and troops into southern Gaza, expanding the two-week-old operation. Soldiers rolled into Gaza from the Kissufim crossing, once the main access point to Jewish settlements, and an access road 2.5 miles to the south, near city of Khan Younis and town of Deir al-Balah. Troops also entered Israel's former Gush Katif settlement bloc, evacuated when Israel ended its 38-year occupation of Gaza last summer. Backed by tanks, they took control of Gaza's main north-south road, cutting the coastal strip in two. A Palestinian policeman was killed and another wounded in an exchange of fire with Israeli forces at an outlying police post near Kissufim, Palestinian hospital officials said. In an airstrike near Kissufim, a commander of the Hamas-linked Popular Resistance Committee was killed, Palestinian security officials said.